After a two-year break, partly to concentrate on paternal duties and partly to rethink his career choices, Imran Khan is back on the big screen this year with Katti Batti. Daughter Imaara is now a year old and Imran feels he made the best decision to enjoy this rare opportunity to bond with his newborn and wife. Khan entered fatherhood on the back of a few box office duds, namely Once Upon a Time in Mumbai Dobara, Matru Ki Bijli Ka Mandola and Gori Tere Pyaar Mein. The trailer of Katti Batti, in which he co-stars with the soaring Kangana Ranaut, was launched three months before the filma��s release date in September. Speaking at the launch, Khan said he felt glad to be back at work and realised how much he had missed shooting a movie. In Nikhil Advania��s film, he plays Maddy, a young, slightly awkward, urban guy in a relationship with Payal (Ranaut). Advani said he was glad to get his first choice actor for the role of Maddy even though Khana��s reaction on first hearing the story was less than enthusiastic. Leta��s wait and see if Katti Batti and Ranauta��s popularity rub off on Khan who is yet to announce any other films after this romantic drama. filing a legal notice against her previous PR agency (for spreading false stories). Ranaut was at her inimitable best at the Katti Batti trailer launch in Mumbai. On a wet Sunday afternoon, she came dressed in a retro style sunshine yellow dress by Delphine Manivet with a wide skirt and severely styled updo. When asked about her look, she replied it was to cheer up the audience on the monsoon afternoon and give them something to talk about. When asked whom she would pick as the queen of Bollywood, Ranaut smirked and said, a�?Is Bollywood a country? Thata��s such a lame question.a�? She also denied various rumours about the film saying that her character is neither pregnant, nor does she play a double role and nor is she Punjabi. What she is she could not reveal, as there is apparently a big twist in the seemingly frothy love story. thereafter. While part one of Baahubali releases next month, the second part (yet to be completed) will follow only in 2016. Two of Rajamoulia��s earlier films have been remade in Hindi: VikramarkuduA�becameA�Rowdy Rathore and Maryada RamannaA�was adapted asA�Son of Sardar. Rajamouli has apparently not seen either of the remakes. The Telugu talent does, however, harbour ambitions of directing a Hindi language film some day. 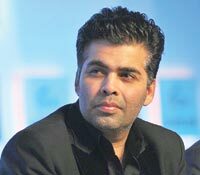 And with Johar, he perhaps has a ready and willing producer at hand.